While it is hard to complain on a stunning 70 degree day in NYC, looking over these photos has made me want to go back on vacation in the worst way! 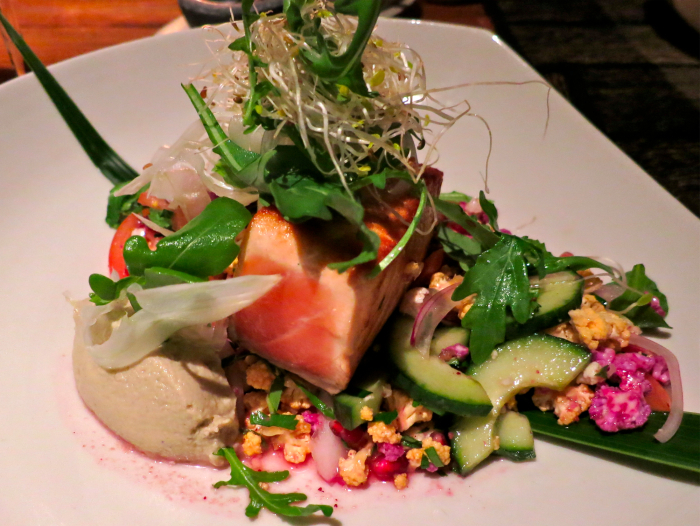 The only non-vegan dish I enjoyed during our stay was this amazing salmon. I eat fish fairly rarely and when I do I am very picky about it's origins and how it is prepared. This one was a true winner. Served with a cauliflower and pomegranate "tabouleh" that reminded me of this recipe and a smoky eggplant puree that reminded me of this one it was light and extremely flavorful. I am now inspired to combine some of my cauliflower and eggplant recipes. What a great pair they make! On to dessert. I very rarely order dessert at restaurants. To be perfectly honest, some dark chocolate or one of my own creations is usually more appealing to me than any heavy restaurant dessert. However, given the healthful nature of the desserts at Parrot Cay I just had to try a few. The most decadent by far was this raw chocolate mousse tart. Topped with bananas and young coconut I could only manage a few bites. Ok, they were a few BIG bites. More often than not when I mention my dietary preferences at a restaurant I am steered towards sorbet for dessert. I never actually order the sorbet as it is usually loaded with TONS of white sugar which is something I refuse to put in my body. How lucky was I that Parrot Cay had sugar free chocolate and coconut sorbet? This icy treat was just barely sweet yet incredibly refreshing. There was a little bit of raw honey at the bottom of the plate which made for the best "topping" ever! Traveling home from a vacation can be tough. I am never that thrilled to go back to reality. Although I did miss Maddy something fierce. To make the journey home that much easier I ordered one last Big Salad to go. Knowing we were departing from a small island airport and would not have access to food until we got home to New York that evening I wanted to make sure I was prepared. This salad made a great late lunch on the plane. At the last minute I also had the hotel pack up some of these raw carob cookies for me. They were just barely sweet, a little nutty and really satisfying. They were great to pull out the last hour of the flight when both Doug and I were getting slightly hungry again.